Thank you for a beautiful reception for my son and daughter-in-law, Stephen & Candice on Oct. 6, 2013. Everything was beautiful, the food was excellent and our guests had a great time. 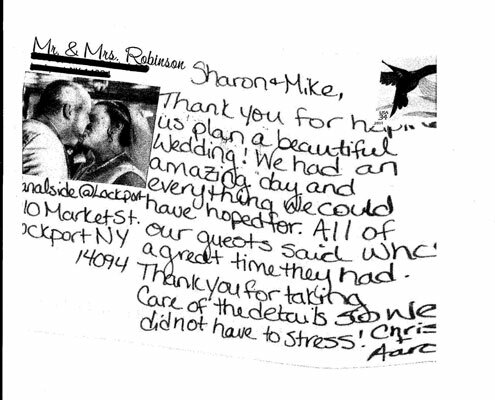 Sharon, you were so helpful to me on planning this reception, by giving me great ideas and by truly wanting this to be as beautiful as if it was for your own family. I will gladly recommend you to anyone needing a place for any event that they need to host. Just thought I'd let you know that we went on our cruise today and thoroughly enjoyed ourselves. Loved the history and the humor. 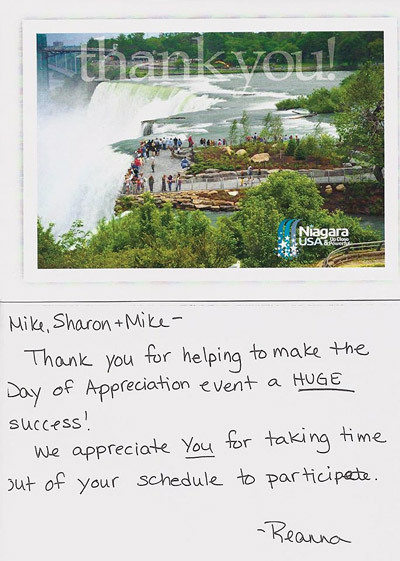 It turned out to be a beautiful day and your employees were all so pleasant it made our trip pure pleasure! Thanks again. Felicia and I would like to thank you again for all the hard work and preparation you did for our Wedding that took place on August 16, 2013. Everyone was amazed with the beauty of the your establishment, both indoors and out. The food was excellent and the service from your entire staff was superb. Our wedding ceremony was picture perfect with all the windows and the natural light coming in upon all of us. 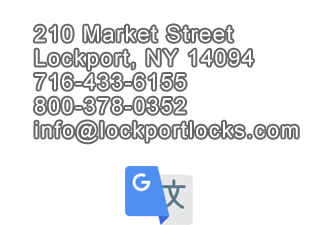 We recommend everyone to consider Erie Canalside at Lockport aka Lockport Locks for their future wedding or party plans. The only thing we regret was not taking everyone on a boat ride down the canal. Maybe we will next summer to kick off our wedding anniversary. 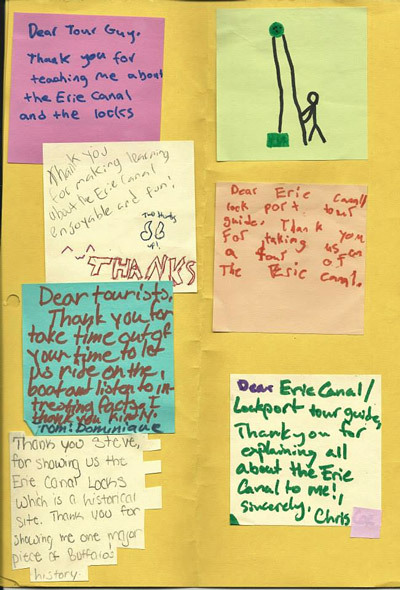 Again, I want to thank you for hosting us in 2012 with our tours. Groups really seemed to appreciate your hospitality! I hope that you fully enjoyed the experience. Joel and I would like to thank you for making our wedding day a memorable event. More than a year later, everyone still talks about how delicious the food was. We loved how you took charge, and made our special day perfect. We especially loved the way we were treated. Like family. Everyone loved the boat ride. The service was spectacular. Joel and I felt we received more than expected. We definitely recommend this venue for all occasions. Love you guys! Again I would like to thank you for our exciting, relaxing cruise along the Erie Canal today. Our sandwiches were excellent and hit the spot. I got to meet your husband, but sadly missed you!!! Hopefully there will be a next time for Brighton Square to get together and enjoy some sunshine instead of looking at these four walls day after day. Again, Thank you so much and hopefully I will get to meet you in the near future. The family and I had a great time today! Perfect day, friendly staff, and clean facilities and grounds! Keep up the good work!! Thank you so much for hosting us, making concessions and treating us so very well. Our guests loved it. Actually, based on your narrative (as told by Neil) our group became very interested in the Tiffany Windows at the Church and we scheduled a visit for this morning. I let them know it was your team that recommended them. The food was great and the buzz afterwards was how beautiful the cruise and dinner was. Can’t thank you enough for making it work. 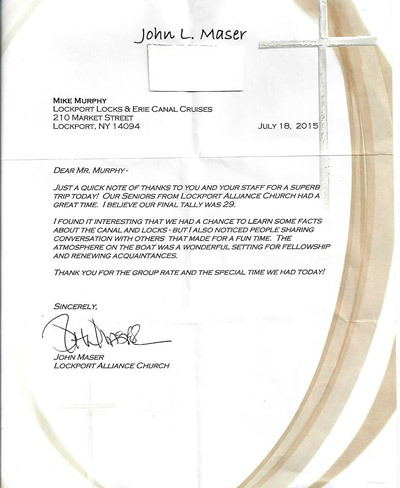 I just wanted to thank you and the cruise team for a wonderful and educational experience on our canal cruise. The tour guide was great and all the personnel we encountered were friendly and informative. I am traveling with the tour director from Knoxville Tours. We just spent the most lovely evening with your Captain and Jeff. They were both so attentive to our group and were so kind to answer questions. Our dinner was wonderful. Thank you for all of your hard work..... It shows in the quality of your service. To Mike and Sharon, Thank you for a very enjoyable evening. We had our bowling banquet at your facility and everyone enjoyed the food and the cruise. 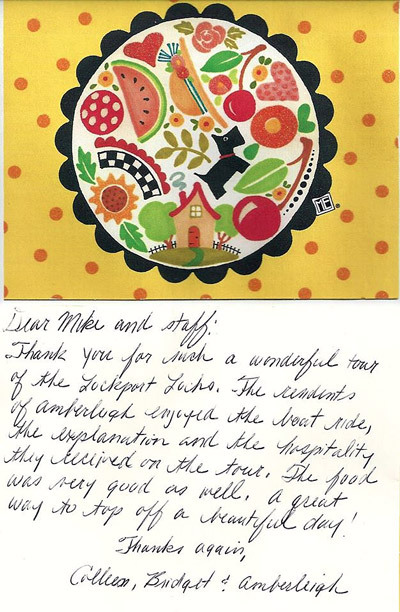 You both were very welcoming and your staff were all very polite. Thank you and your staff for making our event an ABSOLUTE success! Everyone is still raving about the facility, the ride and especially the food. Again, thank you for a great outing!! Hi, Sharon - everyone here cannot stop talking about what a great time they had and how good the food was. Apparently you should patent the eggplant parm! Thank-you so much for everything. This is Katie, the photographer from Joe & Ashley's wedding on July 15. I just wanted to thank you for your kindness and help on that day. It was so wonderful to work with you and amazing to shoot at canalside! What an awesome venue for a wedding and definitely somewhere that we will recommend to others! I put together a gallery for you of some photos of the venue that you may like. Feel free to use them if you want. Made the cruise today and appreciated the friendliness of the crew. Also, enjoyed the cruise and will recommend it to friends. Thank-You! I performed a wedding at your facility on Saturday night and I just wanted to let you know that I can't remember a place that had everything so under control! From the time I arrived until the time I left it was obvious that you know what you're doing. Great Job - Keep it up! I will certainly be recommending you for future events. Ms. Sharon and Canalside Staff! Thank you all so much for making our special day even more than we expected! I can't tell you how impressed I was when I walked into the building - it was perfect! 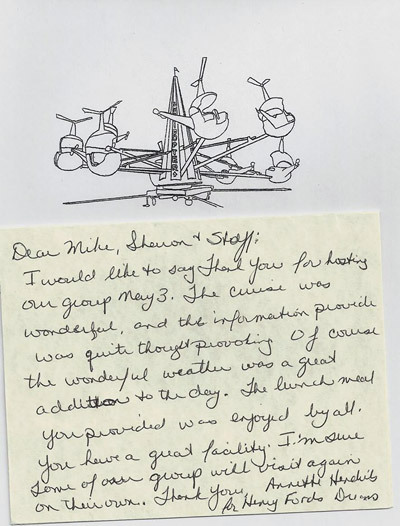 All of our guests, including us, Loved the cruise and were raving about the food! You truly know what you are doing and we will recommend your services to our friends & families! Thank you so much for everything you did to make our wedding so wonderful. The food was terrific, the staff was friendly, and we really enjoyed ourselves. The members of the West Falls Fire Company wish to thank you and your staff for a very wonderful dinner and cruise up and down the Erie Canal. Everyone working there, including yourself, treated us respectfully, even with some humor, which we enjoyed. The food was excellent, and of course the weather cooperated to make it a memorable trip. I would like to thank you and all of your staff for making my daughters wedding the day she always dreamed of. Everything was wonderful. 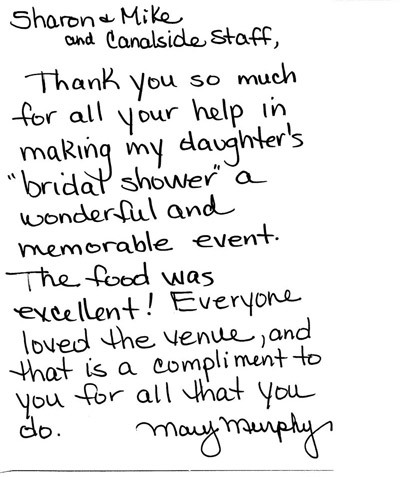 Your staff is professional and courteous, the food,delicious, the decor and garden was just beautiful. Everyone is raving about the boat ride. Every guest had a wonderful time. Thank you for making our day so special. 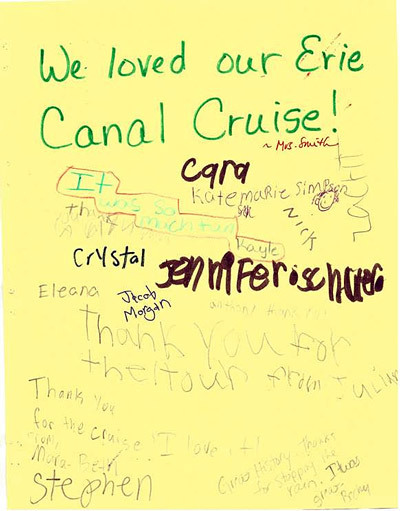 Rhonda H.
Just a quick note... we cruised the canal on one of your trips (12:30 pm) on Monday. What a great cruise! The three gentlemen on board that led the cruise did a great job -- very friendly and informative. We greatly enjoyed ourselves. Thanks very much. 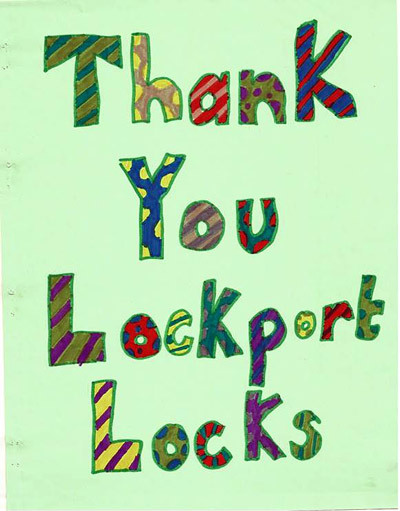 I wanted to express my appreciation for the wonderful experience our students had visiting the Lockport Locks and museum. The field trip brought to life all that we have learned about the Erie Canal. It was an invaluable educational experience that was made possible by the professionalism and vast knowledge that your staff shared with the children. Thank you for giving our students a personal understanding of the importance of learning about our area's rich history. We look forward to visiting with our classes in the future! On Tuesday my husband and I went on the canal cruise; we enjoyed it very much; as it was the first time on a canal. The people were very friendly and they answered the questions that the people asked. THANK YOU VERY MUCH FOR A NICE TRIP - Lise D.
Our group from J and J Travel, had a delightful cruise this summer. They raved about the food. Later in the summer , I took my brother and his grandchild and we did the cruise. They loved it. You have a gem. And in that I haven't been up in two or three years, I couldn't believe how nice and what you have accomplished. It was easy to find, the sandwich was good and of course the cruise was a delight. Thanks. Hope to see you in the future.